Summary: Palm Beach County beaches provide critical habitat for three species of sea turtle: the endangered leatherback and green sea turtles, and the threatened loggerhead sea turtle. Given the magnitude of sea turtle nesting in Palm Beach County, it is essential to have complete and accurate nesting data available for appropriate management purposes. Most monitoring is conducted in support of construction, nourishment, or beach raking activities. 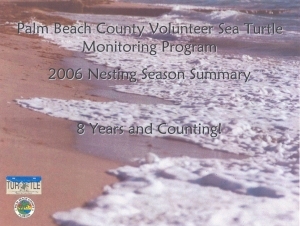 However, 1.5 miles of Palm Beach County will be surveyed by members of the Palm Beach County Volunteer Sea Turtle Monitoring Program in 2006. This program was created to allow for more complete monitoring of Palm Beach County beaches--essentially to fill the existing gaps in monitoring. Created in 1999, the program has since grown to over 70 volunteers who, on average, volunteer over 1,700 hours per season and record approximately 6,000 turtle crawls per season. However, due to a pending nourishment project, only 40 volunteers will participate in 2006. This project will provide partial funding for this program during the 2006 nesting season, including volunteer recognition items, identifying T-shirts, and two handheld GPS units. ERM will provide all volunteer management and oversight, data entry and analysis, all copying and printing costs, three GPS units, and some volunteer recognition items.